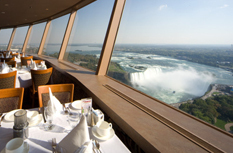 For those with a taste for the extraordinary Skylon Tower Revolving Dining Room simply must be experienced. Our award winning continental cuisine is presented in an elegant setting 775 ft. above the Falls. Lunch or dinner, the menu is rivalled only by the view, which you can appreciate at leisure (one rotation per hour). Dine by night and you'll discover the unique atmosphere created by the illumination of the Falls.